Ship your most ambitious software ideas, with the IT operations partner that shares your vision. We bring dev experience and original strategies to the operability of your application — so you can focus on your business. Increase the flow to production. Reduce waste by automating and fostering a collaborative working relationship between Development and IT Operations. We help you introduce, sustain and benefit from Continuous Delivery. All the while increasing Operability! The connected enterprise brings enormous commercial benefits but also presents a growing security risk by greatly expanding the potential attack surface. We implement, operate and support your private PaaS so you can shield Development from the details of deployment. We take on day-to-day responsibility of your IT Operations as a strategic method to improve their effectiveness and efficiency. Your 3rd party applications on our own hassle-free, fully-managed infrastructure so you can focus on your business rather than servers. O ne of the key goals of DevOps is to ensure that software runs well in the Production environment, especially in the context of regular changes (deployments). ‘Making software run well’ in this dynamic, interconnected world is the focus of Software Operability. 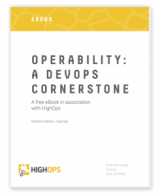 If you lead a team or department in the development or operation of modern interconnected software systems, and want to understand why and how to make your software systems work better, then this free 6000-word eBook is for you.